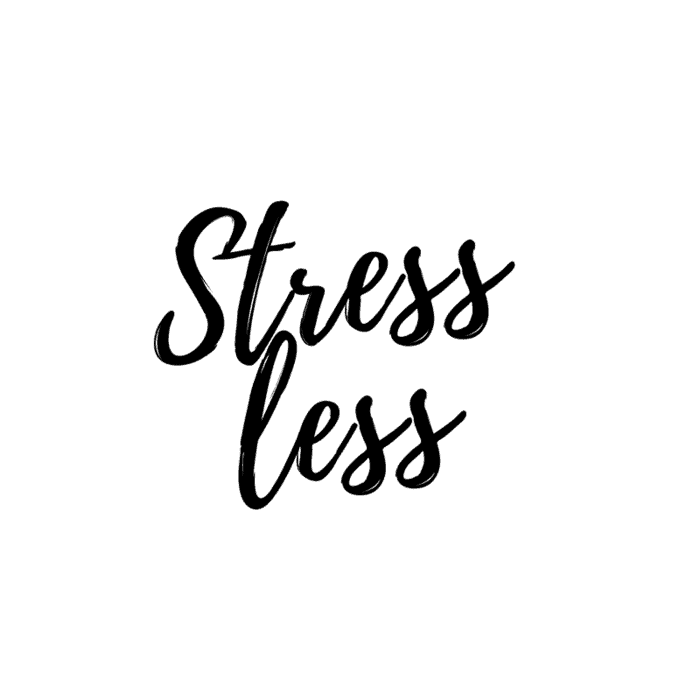 Sharing my best tips for how to stress less and enjoy life more! 2016 was a big year for EBF — I learned how to shoot video, gained a team member and gave the brand/site a fresh new look. While all this was happening, there were a lot of things going on behind the scenes too. Isaac switched career paths and I focused a lot of time and energy into getting my body back to optimal reproductive health. Through this process I honored my body, took a break from exercise, ate more, gained a considerable amount of weight and ultimately healed my hypothalamic amenorrhea. At this point my cycle is back and relatively normal. I feel I’m at a good place to start introducing exercise, which has been awesome because I seriously missed those endorphins. As I mentioned in a recent post, the main culprit of my situation was likely a combination of stressors, that together were too much for my body to handle so it shut down. This whole process has piqued my interest about stress and how it can affects all areas of our life — mood, sleep patterns, weight, hunger, etc. It’s legit crazy how much stress (even at times when we don’t feel stressed) can wreck havoc on our bodies. Get things done ahead of time. This one is common sense, but it’s often forgotten — when you plan ahead and feel prepared you will feel less stressed when the event/situation arrives. I’m very much guilty of being a procrastinator, but whenever I plan ahead and get things done a day or two before they’re due/needed, it feels AMAZING. There’s no added stress of getting it done in time and I usually do a better job because I feel organized and composed while I’m doing the task rather then rushed and frazzled. Write it down. Take time to write down your to-do list and prioritize what needs to get done in a given day, week, month. Leaving your to-do list in your heads creates a scattered brain affect where you constantly remind yourself of the things you need to do. Once everything is written down and prioritized, you can stop repeating the tasks to yourself, get to work, and start checking things off the list. Get to know yourself. Quietly observe yourself and realize what things stress you out and how you react. Once you know what type of situations cause stress and how you typically react, you can learn how to better prepare for similar situations and how to change your coping behaviors. Everyone is so different and what stresses one person out may not affect another person in the least. And there are a variety of reactions to stress as well — anger, crying, smoking, negativity, over eating or under eating, etc. 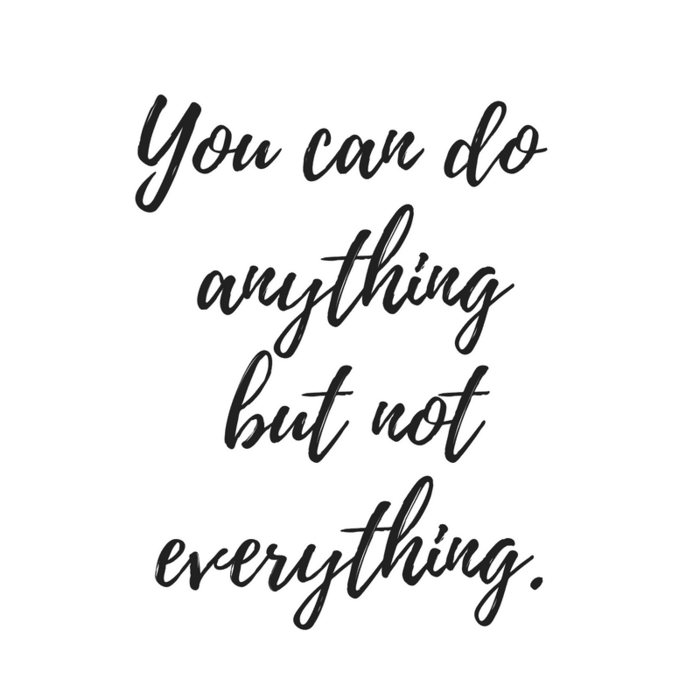 Example: I’ve noticed that I get stressed about traveling, mainly just the act of packing and making sure I’ve done everything I need to do before I leave. I tend to wait until the night before I’m leaving to do the laundry, pack my clothes and start cleaning the house (so it’s clean when I return). I’ve realized this whole process is super stressful for me and often results with me in the kitchen baking something… (aka procrastinating). I’ve noticed that in order for me to be less stressed I need to do my laundry a few days earlier and start planning what I’m going to pack ahead of time. It works wonders! Take time for yourself and do things that relax you. Self-care is #1. Get a massage, schedule a manicure, mediate, take a walk, go to a yoga class, read a book or take a bath. Do something that you love, whatever that may be. Put your phone away. Technology is awesome and connects us in a variety of ways, but it can also be a huge distraction (i.e. texting or checking email/social media WHILE you’re trying to work or catch up with your family at the end of day). It’s so overwhelming and stressful to check a bunch of different social media accounts and be on all the time. Take phone breaks by silencing your phone while you’re doing important tasks and take a break from it once you’re at home for the night. Let go of perfection. We have to accept that everything isn’t always going to be “just so” and that’s okay! Remember that no one in the entire world is perfect. Embrace imperfections as they’re what makes us unique. Struggling with this one? Read this. Learn to say no. This is especially hard for people-pleasers, but it can be so liberating once you start doing it. I love this Zen Habits article about saying no so that you can say yes to things you really want to do. I feel like this one is especially important around the holidays. You don’t HAVE to commit yourself to things you don’t want to do! Just find a nice way to politely decline. Your friends and family will understand. Boost your mood. Get outside for some fresh air and sunshine (hello Vitamin D) or take a whiff of something citrus or lavender scented. I love burning a soothing scented candle (like this grapefruit candle) or loading my diffuser up with mood-lifting and/or calming essential oils. Grapefruit, orange and lavender are my go-tos. Get plenty of sleep. I know this one is hard when you’re staying up late to get things done or struggling to sleep because of anxiety, but adequate sleep (at least 7 hours a night) is so important. Read all about the benefits of sleep here and if you’re struggling with sleep, check out these science-backed tips for better sleep. Eat well. Research has found that when our cortisol levels go up, we tend to reach for foods filled with sugar and fat. 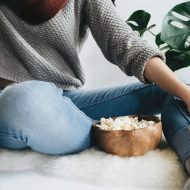 After the initial pleasure of these junk foods wears off, we’re typically battling mood swings, irritability, and other unpleasant emotions on top of the stress we were experiencing in the first place. By choosing to eat healthy and nutritious foods you can impact your mood on a positive note, helping to relieve tension, stabilize blood sugar, and reduce stress packing. Some of the best foods for busting stress include eggs, dark leafy greens, citrus, pumpkin seeds, salmon, flaxseed and dark chocolate. Need to destress? Try this grapefruit avocado salad, which combines citrus with leafy greens. Exercise. You knew this one was coming, right? Exercising boosts your endorphins, improves your mood and can help improve your sleep as well. Pick workouts that you enjoy so that they’re something you look forward to rather than another thing on your to-do list that you dread. I highly recommend this 10 minute morning yoga routine. Laugh more. Laughing increases endorphins released by your brain, reduces stress and soothes tension in your body. Add more humor to your life by listening to comedy, hanging out with funny people and/or watching funny videos on YouTube. Great tips! I am a big fan of to-do lists. I recently started implementing them in my days. I am keeping this list for reminders throughout the new year. Happy Holidays!! This is a great post today, and I’m sure this weekend will be busy (and stressful) for everyone with the holidays. Could not agree more with this list! Sometimes it’s hard to fit in exercise and easier to eat out than eat healthier food at home, but I always feel SO much better when I make both of those things happen! I so needed this post, thank you!!! 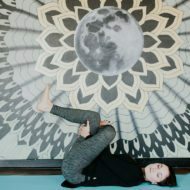 I would love to see another post about getting your period back and how you (mentally) allowed yourself to be in a space to not workout, and to just EAT. It is so much easier said than done, especially for those of us with eating disorder histories. Your story was so inspiring – I still haven’t gotten my period back (more than just a few random 2 month cycles) for over 7 years. I’m not underweight by any means, so I feel like your story really resonates with me. I really love this post! I personally stress way to much, so I am really looking forward to trying more of the thing you have written here! Especially getting more sleep and exercising! Learning to say no is such a great tip! It’s one of the things I’m worst at, because I know overextending yourself is not a good habit to have.